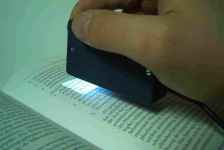 The mini hand-held video camera has a built-in LED to illuminate the document. An electronic system automatically calculates a suitable average image brightness. With this hand-held camera, the user goes over lines of text. The image is transmitted simultaneously on the tactile display TIM, where it is detected by the reading hand. The abbreviation TIM stands for Tactile Interactive Monitor. The VideoTIM display has an excellent tactile quality. Any pixel can be located exactly. TIM has an array of 16 by 16 (=256) tactile dots (pixels) and a size of 4 x 4 cm (1.6 x 1.6 inch). 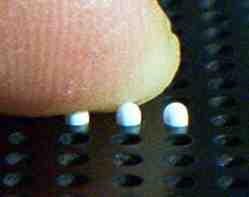 The dotspace is 2.5 mm (0.1 inch). The user puts one hand on the VideoTIM display. 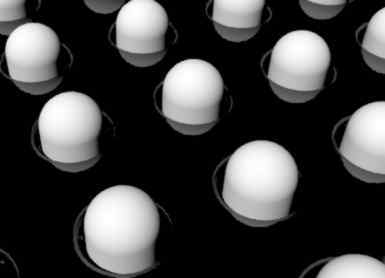 He can change between active and passive recognition. Active recognition means moving the hand over the tactile dots and the fingercups recognice the details. The picture appears as a relief. The passive recognition uses the TPS - the Tactile Projection System by ABTIM. The soft knocking dots stimulate pictures onto the skin of the fingers. The two buttons to the left of the tactile display of the VideoTIM3 allow to zoom in or out of the image as necessary. The single button on the right of the TIM is used to switch the display contrast levels, or to invert (negative image). The knob (potentiometer) to the right of the screen determines the brightness of the image and at the same time, the line width shown. Thin lined letters are usually easier to read. The switch above theTIM display is used to make hair-fine lines (eg in tables) more visible. The image captured by the mini hand-held video camera is transmitted in real time with 24 frames per second on the tactile display TIM. A document holder prevents slippage of the document. The camera guiding hand moves in a straight line over the text lines. The camera movement is out as fast as the text can be read tactilely at the same time. The VideoTIM3 shown here has compared to the previous models, a number of technical developments that serve mainly the optimized image on the tactile display. In addition, the buttons are ergonomically positioned next to the tactile display. And the reading hand may now rest on a larger area on the VideoTIM housing.